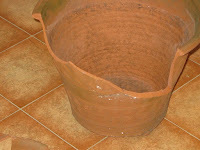 A broken pot made me think about the church. Repairing the pot was tricky, but putting together the fragmented Humpty-Dumpty church in St Neots would be far, far harder. A couple of weeks ago we had a bad storm during the night. In the morning one of the patio pots had blown over and the bay tree it contained was sprawled out horizontally. 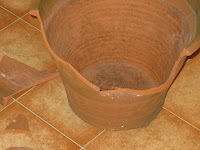 The bay was soon rescued and planted in the garden, but the pot was badly broken. Normally I would have disposed of the pot and bought a new one. But this pot was rather special. When Donna and I were married in 1998, our friends Tony and Faith ordered it as a wedding present. Not only was it made specially, it has our names and the date fired into the hand-decorated surface. The pot just had to be rescued, so out came the Araldite and I spent some time yesterday glueing the shards back together. I learned a lot while doing the work. For a start, you can't put the pieces together in a random sequence. Experiment (without glue) showed it would be easy to stick one piece back only to make it impossible to fit the next one. Also, it took gentle persuasion to get a snug fit. And I discovered that the adhesive itself takes a certain amount of space, only a little perhaps, but it mounts up and is significant towards the end. The photos show some of my progress. The pot is now complete once more although the cracks are clearly visible. With some careful use of terracotta filler I hope to make them a lot less noticeable. This process got me thinking about the church (something that has been on my mind a great deal recently). 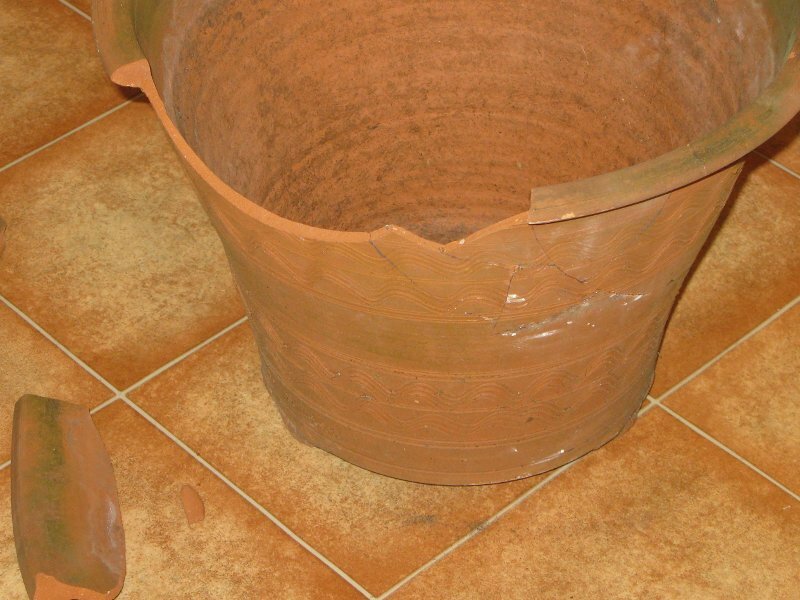 You see, the church is shattered and needs mending - just like our poor pot. The pieces need to be carefully fitted together. Like the pot, the church is something rather special, Jesus is not going to merely dispose of us and replace us. Here in St Neots it's not easy even to make a proper catalogue of the pieces. There are three Anglican churches (all called St Marys just to catch the unwary). The Baptists, two Methodist congregations, Roman Catholic, the Evangelical church, United Reformed, and at least two independent groups - Open Door and River Church. Then there are the various little groups I'm involved with and very likely others I'm not aware of. And finally there will be some people who are part of a church meeting in Bedford or Cambridge or Peterborough. I know several of these but surely not all. How can I put these parts together? I can't even draw up a full and consistent list! What would be the correct sequence? What would I use as adhesive? Frankly, if the church in St Neots is to be mended it will take someone far, far wiser and more knowledgeable than me. Surely Jesus is the only one capable of such work? And even if I could manage to repair the church in St Neots, what about all the other towns and cities around the world, let alone the millions of small villages? So at least we know who to look to for the answer. I do have a sense that he has already begun this most difficult task and that he will not rest until it is completed. Wherever you live and whatever your style of church, are you ready to respond to him? Will you allow him to use you in his work of restoration? Hello Chris - I'm enjoying reading your blog, and the mosaic page was an unexpected treat. I have seen that feature in pictures, but not as a webpage. 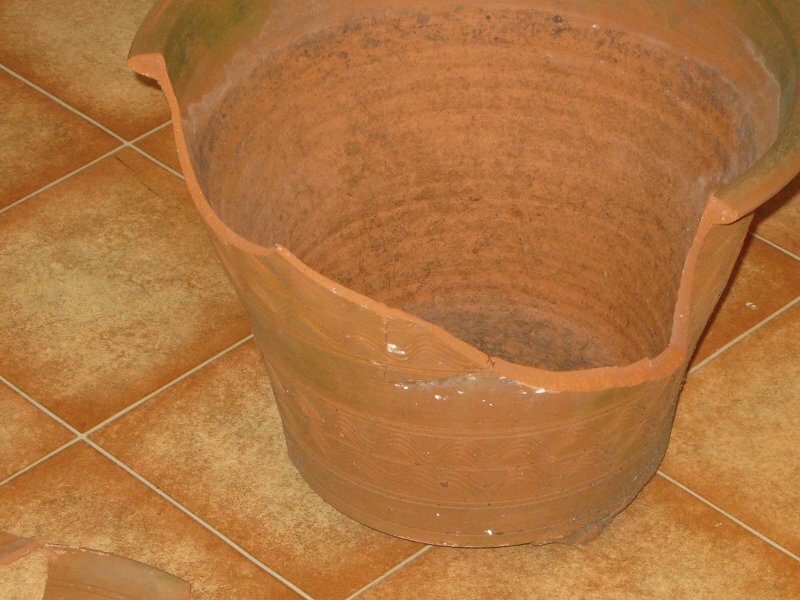 Your post "The broken pot" relating to the church is a great analogy. My thoughts on that are that the church is made up of many broken pots...us. I think that in order to restore the church, the people who make up the church need to allow the Master Potter to restore or remold them to be fully useful to Him. We will never be fully perfect this side of Heaven, we will carry our scars from this world until we leave here. But we can allow Him to mold us into fully useful vessels for Him. Scars and all. Jesus is the only one who can accomplish the task of restoring the church, and He will accomplish that through us, if we let Him. Thanks for dropping by with a comment. You are absolutely right about us being like pots too. Maybe you were thinking of the passage in Jeremiah. There's a lovely old Fisherfolk song based on that.